(Nanowerk News) Glass-fronted office buildings are some of the biggest energy consumers, and regulating their temperature is a big job. Now a façade element developed by Fraunhofer researchers and designers for glass fronts is to reduce energy consumption by harnessing solar thermal energy. A demonstrator version will be on display at Hannover Messe. In Germany, buildings account for almost 40 percent of all energy usage. Heating, cooling and ventilating homes, offices and public spaces is expensive – and offices with huge glass façades are one of the worst offenders in terms of energy wastage. In the summer, these buildings begin to resemble giant greenhouses that take an enormous amount of effort to cool, while in winter heating requirements shoot up because of insufficient heat insulation for the glass surfaces. In a bid to cut energy consumption, researchers from the Fraunhofer Institute for Machine Tools and Forming Technology IWU in Dresden have teamed up with the Department of Textile and Surface Design at Weissensee School of Art in Berlin to develop façade components that respond autonomously to sunlight and its thermal energy. The demonstrator is based on a concept by design student Bára Finnsdottir, and consists of a matrix of 72 individual fabric components shaped like flowers. Each textile module has shape-memory actuators integrated into it; thin 80-millimeter-long wires of nickel-titanium alloy that remember their original shape when exposed to heat. Should the façade heat up due to the sunlight falling upon it, the wires are activated and noiselessly contract to open the textile components. The exposed surface of the façade is covered and sunlight can no longer penetrate into the room. As soon as the sun disappears behind a cloud, the components close again so that the façade is transparent once more. The effect is thanks to a special lattice arrangement in the material. “When you bend the wire, it keeps that shape. Then when you expose it to heat, it remembers the shape it had originally and returns to that position. 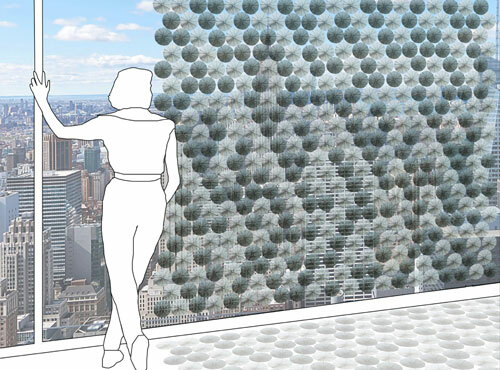 Picture the façade element as a sort of membrane that adapts to weather conditions throughout each day and during the various seasons of the year, providing the ideal amount of shade however strong the sun,” says Bucht. Designed for large expanses of glass, the sun shield can be attached either on the outer layer of glass or in the space inbetween in the case of multi-layer façades. The innovative structure is easy to retrofit and comes with a range of design options, allowing you to choose the pattern, shape and color of the individual components. “For instance, you might want to replace the circular design with triangles or a honeycomb arrangement. You can also control the level of sun exposure for individual sections of the façade – just the top left area, for instance. What’s more, the membrane even fits on curved areas of glass. We’ve reached the point where the design has become independent of the shape of the building,” says the researcher. Bucht and his team will be presenting the wealth of design options at Hannover Messe. Visit them in Hall 2, Booth C22 from April 13-17 to see the demonstrator in action. Visitors will be able to actively control the façade using a tablet app specially designed for the purpose. In the next phase of the project, the researchers want to collaborate with industry partners to develop a range of prototypes for private and office buildings, with the intention of testing them long-term on a detached house and on buildings at the institute. “One priority will be to design fabric elements that are stable enough to withstand any weather,” says Bucht of the work ahead. The plan is to have versions for new builds as well as variants suitable for retrofitting onto existing buildings. The goal is for the systems to be ready for market launch by mid-2017.